Join 10,096 families served since 2010! For many, the arrival of spring flora is overshadowed by one big inconvenience: allergies. The sneezing and sniffling, the itchy throat and watery eyes, the congestion and tickling… seasonal allergy symptoms are so annoying and even debilitating. No wonder so many resort to over-the-counter antihistamines to get just a few hours of relief! It's important to point out that allergies are not “normal”. Most often, allergies are a symptom of an underlying problem, such as HPA axis dysfunction and/or gut dysbiosis. In fact, I can personally attest to allergies as a symptom of HPA axis dysfunction. After never having seasonal allergies, I suddenly developed them in June of 2017. It took a few more months of high stress, low energy, and some extra pounds for me to realize that I wasn't just having seasonal allergies. I was reacting to my environment because my HPA axis was wrecked (i.e., adrenal fatigue). New allergies, especially to foods or your environment, are a big indicator of HPA axis dysfunction. Likewise, gut health plays an important role in allergies. Wardee used to suffer with terrible seasonal allergies, but she was able to heal them completely by healing her gut! So, please… if you do suffer from seasonal allergies, look into the health of your gut and HPA axis. Allergies don't go away on their own! Now… until you do heal your HPA axis or your gut, what can you do? Skip the allergy medication (which isn't good for your body anyway), and use a more natural, holistic approach. Use essential oils! 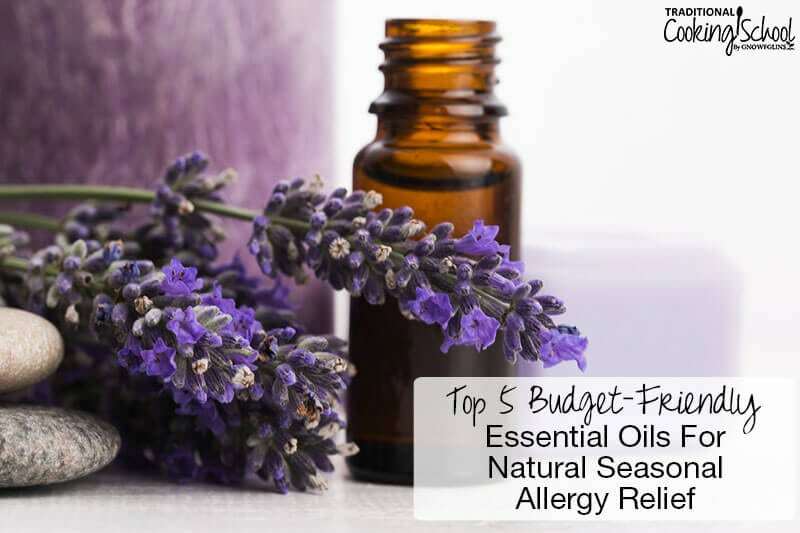 Not only are these oils potent and powerful to bring relief from those annoying allergy symptoms, they're also easy on your wallet. Because who needs another expensive supplement, right? 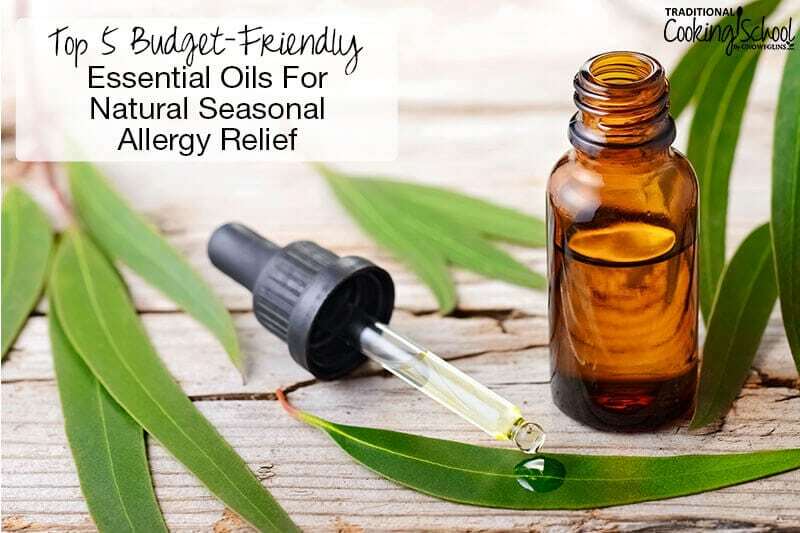 Although more expensive and precious oils are effective against seasonal allergy symptoms, too — like frankincense and Roman chamomile — we know that those aren't the most frugal options. Especially if you have a big family of allergy sufferers! Our preferred sources for essential oils, Rocky Mountain Oils and Aroma Foundry, are reasonably priced and high quality, making it more affordable for you and your family to find symptom relief without breaking the bank! 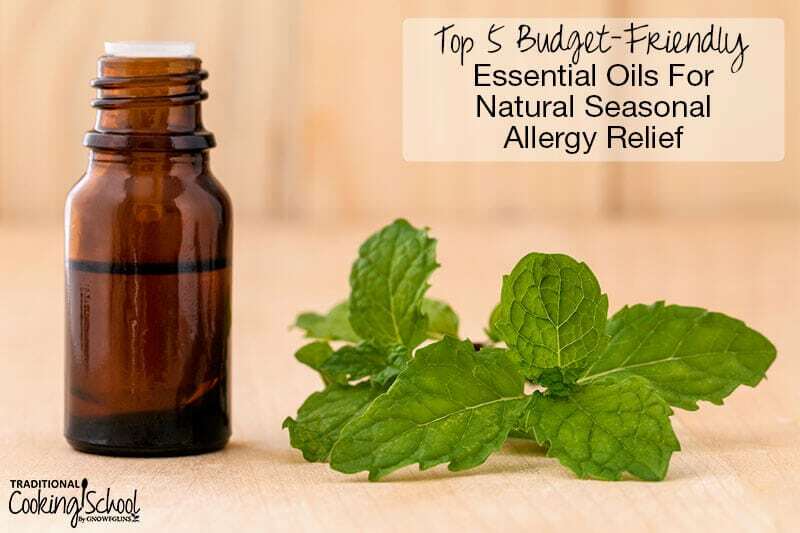 Here are 5 budget-friendly essential oils you'll want to keep on hand at all times during allergy season, whenever that is for you! Seriously, is there anything lavender essential oil can't do?! It's truly all-purpose — and budget-friendly! It's not just lavender's smell that's calming and soothing… The properties of lavender essential oil are literally calming and soothing, so when you're sneezing your head off or about to scratch your eyeballs right out of your head, you NEED to calm that mess down. Lavender to the rescue! As a natural antihistamine, lavender not only reduces allergy symptoms, it can also help strengthen your body against allergens (source). To use: Inhale straight from the bottle or make an essential oil inhaler. Place a (diluted) drop under your tongue or on the roof of your mouth. Sneezing or an itchy throat go away almost instantly! Diffuse alone or with other allergy-relieving oils, such as peppermint and/or lemon. Diffusing essential oils helps clean your environment of airborne allergens such as dust or pet dander. Add a few drops to a relaxing bath. Try a lavender pillow spray to relieve nighttime allergies. Can be applied NEAT (undiluted). If you're congested or experiencing sinus pain with your allergies, reach for the peppermint essential oil. It has clearing properties — perfect for a stuffy nose! Additionally, if allergies aggravate asthma or bronchitis, peppermint essential oil can minimize airway inflammation and promote easier breathing and more open airways (source). Peppermint is also helpful for relieving headaches that sometimes come with allergies. Avoid using peppermint essential oil near the faces of children under the age of three. To use: Inhale straight from the bottle. 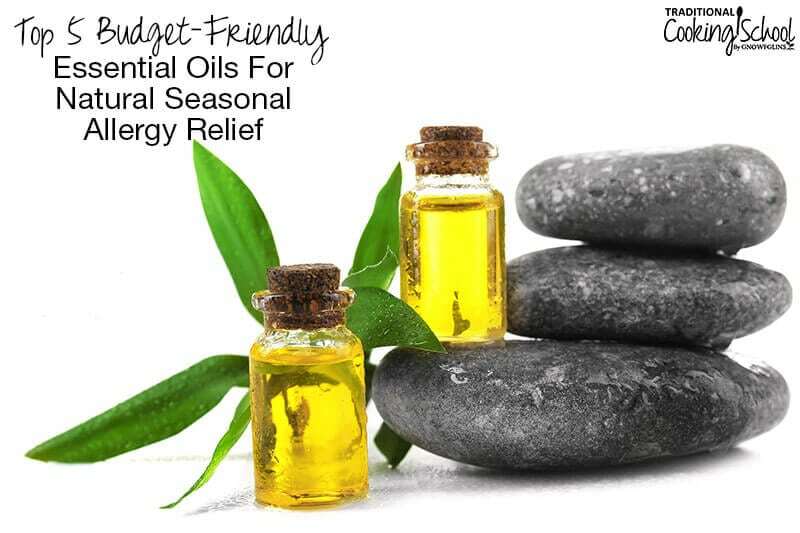 Diffuse alone or with any of the other allergy-relieving oils mentioned here. For bad congestion, add 1 drop of peppermint oil to a steam tent. Just close your eyes; peppermint essential oil burns! Make a roll-on with peppermint oil and rub it on your temples, forehead, or back of your neck for headache relief. Always dilute with a carrier oil before applying to the skin. Cold-pressed from lemon rinds, lemon essential oil is potent, yet extremely inexpensive. When used alone, it is cleansing and purifying — great for clearing the air in your home or office. Yet, personally, I find lemon to be most effective against allergies when mixed with lavender and peppermint. To use: Inhale straight from the bottle. Diffuse alone or with equal parts lavender and peppermint oils. For topical application, combine lemon, lavender, and peppermint in equal parts and add to a roller bottle. Fill to the top with carrier oil of choice, then apply to the neck and chest to stop itching, clear nasal passages, and relieve watery eyes. Or, place a drop of the diluted lemon-lavender-peppermint combo under your tongue or on the roof of your mouth. Try this combination in an aromatherapy inhaler and inhale when symptoms arise. Eucalyptus essential oil opens up the nasal passages, making breathing easier. This is especially helpful if your allergies cause sinus congestion, wheezing, or other upper respiratory distress. Its scent is also soothing and calming. Frugal eucalyptus oil can also relieve allergy-related headaches. Avoid using eucalyptus essential oil near the faces of children under the age of ten. To use: Inhale straight from the bottle. Place a drop or two in a steam tent and inhale deeply for 5 to 10 minutes. Diffuse alone or with any of the other allergy-relieving oils mentioned here, especially to clear your environment's air. Use alone or with peppermint oil in a roll-on to relieve headaches. Add a few drops to a hot bath. Always dilute with a carrier oil before applying to skin. As one of the most budget-friendly oils, tea tree is definitely one to keep in your collection! To use: Add tea tree oil to a diffuser daily to prevent or relieve allergy symptoms, especially if airborne allergens are a problem for you. Diffuse alone or with lavender, eucalyptus, or peppermint oils. Dilute with a carrier oil, such as coconut, jojoba, or almond oil, and apply to hives or rashes. Love using essential oils to naturally treat and prevent all sorts of issues? Check out these helpful posts! How To Organize & Store Essential Oils… For Cooking & Daily Life! 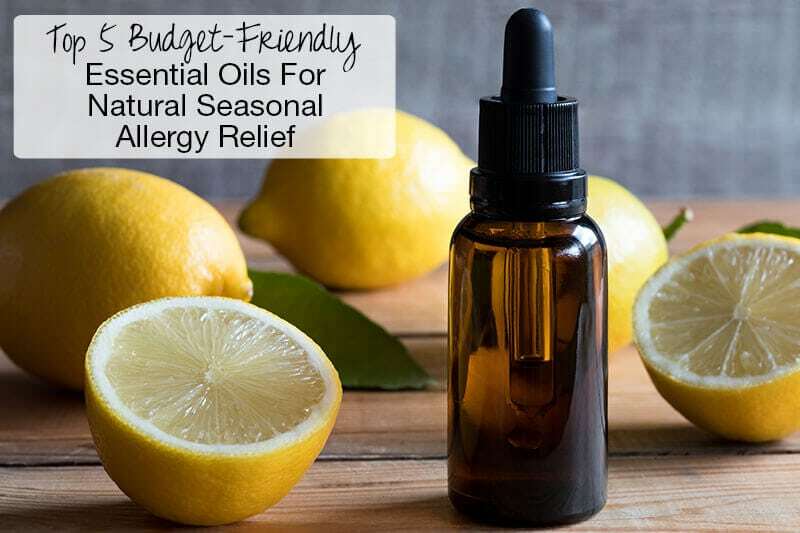 Do you use essential oils for allergy relief? Which one works best for you? Native Texans, Lindsey and her family now live in the northern Minnesota wilderness on their dream property, where they are attempting to raise chickens and a few of their own veggies. In her free time, she enjoys food photography, flipping through cookbooks, and tackling home improvement projects. She also serves on the board of her local food co-op. Lindsey has dedicated much of her time over the past several years to unlearning conventional practices and implementing Traditional foods and natural remedies in her home. This has radically changed her and her family's health. Lindsey now loves to share her knowledge and recipes through her blog All The Nourishing Things and her eBooks: Nourishing No-Bake Treats and Sweet Without Sugar. I use the lavender/lemon/peppermint combo and just drink it down with water. It worked so well last year but this year I’m finding I have to do it multiple times a day and I’ve been doing it for at least the last 5 days. Are you saying that those more expensive essential oils would be more effective? I’m willing to try anything to get this itching headaching head of mine to calm down. What would the recipe be for the Frankincense and Roman chamomile? As a side, I never used to have seasonal allergies until about 2 years ago so I know I need to buckle down and look at what is really going on but I haven’t prioritized it yet. Hi Jen, no, I’m not saying the more expensive oils are more effective. I personally pick these oils over frankincense, for example, because they work and are way cheaper! I use the lemon/pepppermint/lavender trio for my allergies. Works real well for me. Article was well written. Lots of good information on essential oils and possible causes of allergies other than the usual suspects. Thank you! I love studying and writing about essential oils!